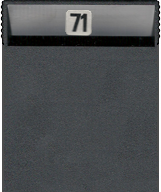 ColecoVision.dk presents: Battleship Clapton II © 1983 by: T&E Soft. Initially © and Licenses: T&E Soft Inc. Original Programmer and/or Designer: Unknown, T&E Soft Inc. Original SFX Programmer: Unknown, T&E Soft Inc.
ColecoVision GFX Programmed by: T&E Soft Inc. This Cartridge contains 2 games. Maneuver the space Battleship Clapton II to avoid space mines, and at the same time, destroy enemy fighters with your beam gun. Your Score will rise, but the speed of fighters will increase. 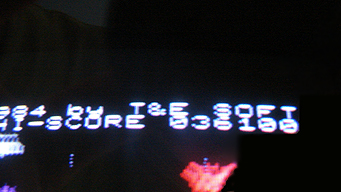 High Score For The ColecoVision Version Of: Battleship Clapton II. 1st XScore: 60.800 - March 11, 2009. 1st XScore: 68.150 - March 22, 2014. 1st XScore: 36.100 - July 13, 2009. 2nd XScore: 2nd XScore: 43.000 - March 21, 2014. 2nd XScore: 30.800 - September 18, 2010. 3rd XScore: 3rd XScore: 41.400 - March 21, 2014. 3rd XScore: 29.350 - July 20, 2009. 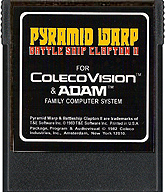 ColecoVision.dk Game # 71 B, Battleship Clapton II is last updated: March 31, 2019.